Are you still writing down orders? Automate the sale of your fast moving products by enabling your customer to purchase their products with a single click of a button. With the Clicksale button you automate your sales processes and increase the throughput of your team. Stop waisting time on writing down orders and automate your sales processes. Enable your customers to order your products in a fraction of a second. Maintain your foothold at your customers location with an easy to use product. Make sure your products are always stocked. With our suite of mobile tools your salespeople can get up and running in no time. iOS and Android apps for configuring devices. Sales and configuration overview in our dashboard app. Full access API for manage your data. An easy to use system that can hook up to any ERP system. 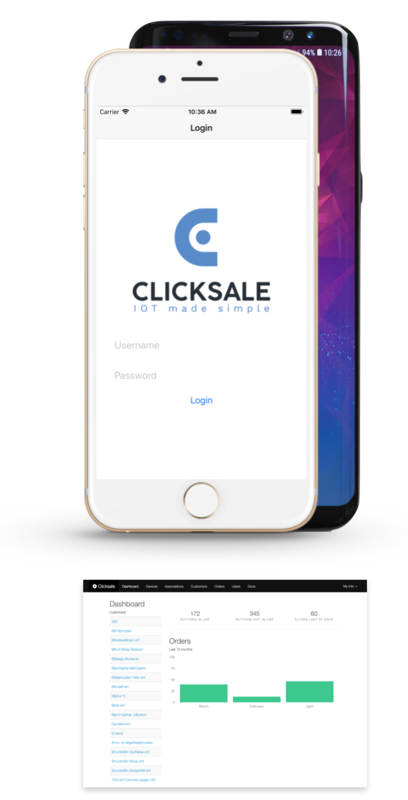 We have developed the state of the art solution for sales with internet connected devices. You can use our own cloud architecture or host it on your own servers. We believe it's important that all of the major software functionalities are available on our mobile platform. Salespeople are continuously on the move and need up to the minute information when needed. With our full access API you can connect our software with your in house solutions. We offers a fantastic suit of dashboards that give your managers a good overview of your sales pipeline. Don’t wait, get the development kit now.